Throughout much of the nineteenth century, wealthy women's involvement in the public sphere often involved religious or charitable work. During an era when governments provided few social programs, Virginia’s women founded orphanages and schools and focused on helping girls and women. These women also supported domestic and foreign missionaries. Such activities were considered socially appropriate for women as extensions of their family responsibilities. Other women organized to speak out on social issues that had political ramifications, such as temperance, slavery, and other moral reform issues. 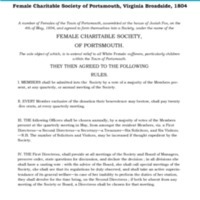 One of the earliest benevolent societies founded by women in Virginia was the Female Charitable Society of Portsmouth, Virginia, which first met in 1804 at the home of Quaker Josiah Fox, a naval ship builder. 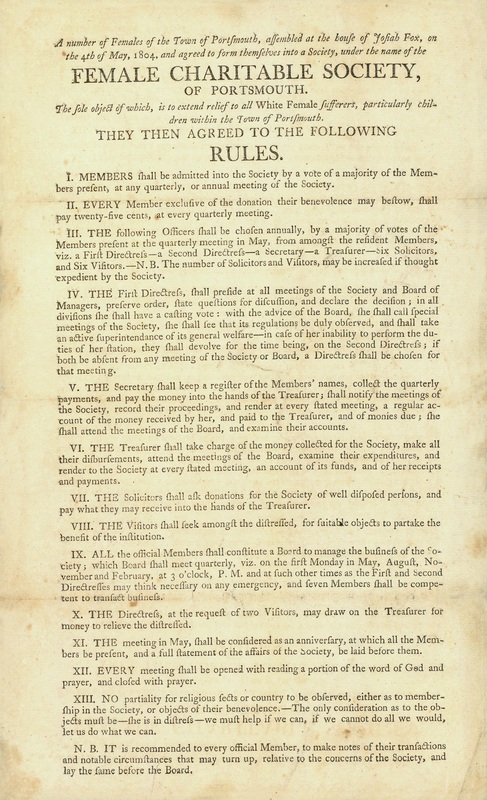 Other societies were later created in Virginia, such as the United Daughters of the Confederacy to honor the memory of those who served in the Confederacy; the Mount Vernon Ladies Association, charged with the preservation of George Washington's home; and the Association for the Preservation of Virginia, which focused on preserving historic sites. Citation: Hummel, R.O. Southeastern broadsides 3136, Broadside Collection, The Library of Virginia, Richmond, Virginia. Current Connections: What explicit and implicit arguments were made a past presidential for why a woman should not be elected into office? Analyze: What was the goal of the Society and who was it intended to help? Who was excluded? Analyze: Do you think these societies would have changed the status of women in Virginia? Why or why not? Analyze: What arguments are made in favor of women not having the right to vote? In your opinion, which, if any of these, are justified by historical fact? Be specific. 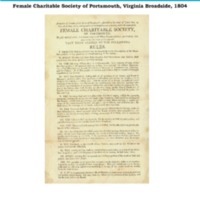 “Female Charitable Society of Portsmouth, Virginia Broadside, 1804 ,” Document Bank of Virginia, accessed April 21, 2019, http://edu.lva.virginia.gov/dbva/items/show/186. 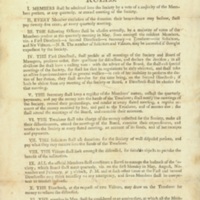 Document Bank of Virginia is made possible with federal funding provided through the Library Services and Technology Act (LSTA) administered by the Institute of Museum and Library Services (IMLS).